Shafii, M., and Shafii, S. L„ eds. (1990). "Biological Rhythms, Mood Disorders, Light Therapy And The Pineal Gland." American Psychiatric Press, Inc., Washington, DC. Wurtman, R. J. (1980). "Neuroendocrinology" (D. T. Krieger and ]. C. Hughes, eds.). Sinauer Associates, Sunderland, MA. Arendt, J. (1995). 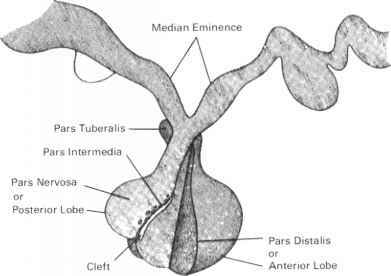 The pineal gland: basic physiology and clinical implications. Endocrinology (L. J. DeGroot, ed.) 1, 432-444. Dubocovich, M. L. (1995). Melatonin receptors; are there multiple subtypes? Trends Pharmacol. Sei. 16, 50-56. Pierpaoli, W., and, Jesnikov, V. A. (1994). The pineal aging clock. Evidence, models, mechanisms, interventions in the aging clock. Ann. N.Y. Acad. Sci. (W. Pierpaoli, W. Regelson, and N. Fabris, eds.) 719, 461-473. Waldhauser, F., Frisch, H., Walhauser, M., Weiszenbacher, G., Zeitl-huber, U., and Wurtman, R. J. (1984). Fall in nocturnal serum melatonin during prepuberty and pubescence. The Lancet, Feb. 18, 362-365. Wurtman, R. J., and Axelrod, J. (1968). The formation, metabolism and physiologic effects of melatonin. Advances in Pharmacology, 6, 141-151. Ebisawa, T., Karne, S„ Lerner, M. R., and Reppert, S. M. (1994). Expression cloning of a high-affinity melatonin receptor from xenopus dermal melanophores. Proc. Natl. Acad. Sci. USA 91, 6133-6137. Martin, J. E., and Sattler, C. (1979). Developmental loss of the acute inhibitory effect of melatonin on the in vitro pituitary luteinizing hormone and follicle-stimulating hormone responses to luteinizing hormone-releasing hormone. Endocrinology (Baltimore) 105, 1007-1012. Reppert, S. M., Weaver, D. R., and Ebisawa, T. (1994). Cloning and characterication of a mammalian melatonin receptor that mediates reproductive and circadian responses. Neuron 13,1177-1185. Sugden, D„ Chong, N. W. S„ and Lewis, D. F. V. (1995). Structural requirements of the melatonin receptor. Br. J. Pharmacol. 114, 618-623.